Beginning with Control 4.40.1002.1901, products can now define which Expense Account will be used for each part type on line items in orders, estimates, and service tickets. Below we will explain in more detail how this works. Prior to this version, the expense account used for a line item's part was selected directly from the part's setup. Within the product setup there is now a mechanism to control the expense account selection with more flexibility. 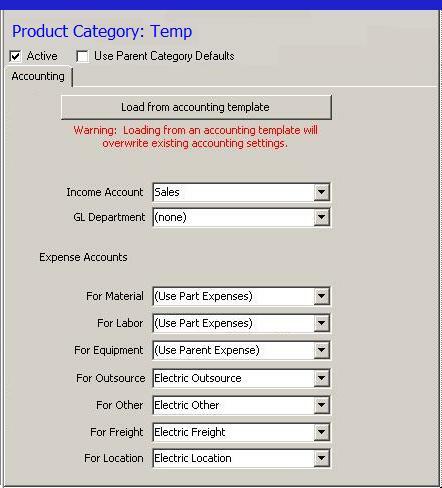 Use Individual Part Expenses: This will coincide with the current behavior of expense account selection. This will also be the default option selected. 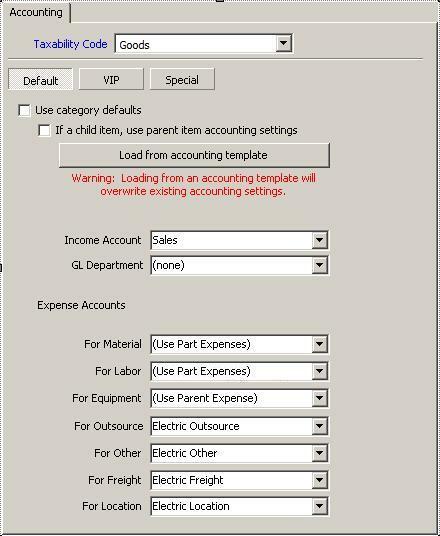 Use Category's Expense: This will allow individual part type expense accounts to be inherited from the Product Category. A list of the expense accounts set active in Accounting Setup. Product Categories additionally will have options to choose these expense account settings on an Accounting Tab very similar to the new one in Product Setup. These options will also be able to be inherited down at the product level. Additionally you will be able to set these expense account settings as global templates in order to quickly change them when needed. The expense account settings will also be available on the advanced tab of each line item on orders, estimates, and service tickets. These can be set and will override the settings defaulted in from the product setup. 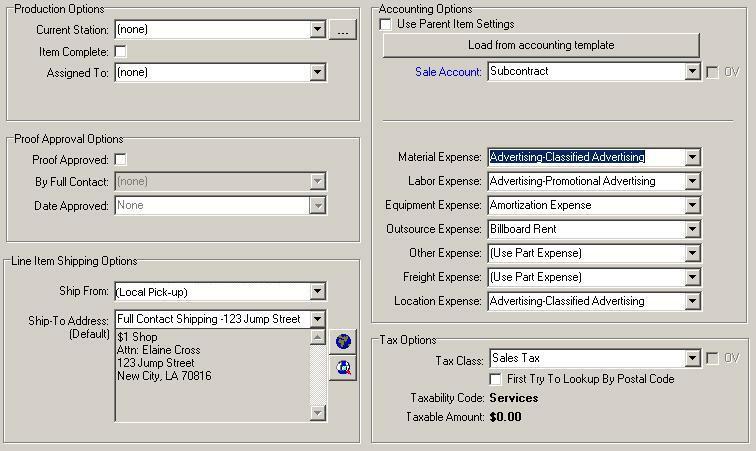 Finally there will be an additional option on the accounting tab of product setup that can be set to make a product use its parent product's accounting settings if it is a child product on the order, estimate, or service ticket. This is the default operation of a product in regards to its expenses. Looking at the activity for the order we will see GL Entries for the parts that have had usage posted to them. Any other equipment part costs will likewise use the Digital Expense account, while the materials will all use the Roll Print Expense account, and the other types of parts will use the accounts set on each individual part. On the Line Item's Pop up window, go to the advanced tab. The box will now show as overridden and changes to the product and re-saving will not overwrite this expense account chosen. Expense accounts set on bills cannot be overridden. In this case the Vinyl and the equipment parts would be saved to the Digital Expense Account, all other materials would be saved to “Roll Print Expense”, and all parts of other types will have their costs saved to the expense account defined on each part. Enables the user to be able to override the expense accounts on each line item as necessary.